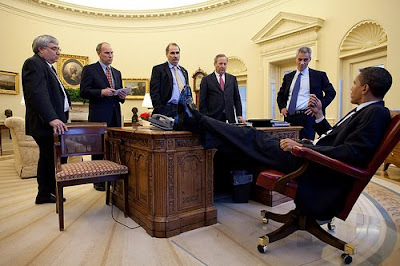 Does this photo of President Obama in the Oval Office convey anything to you about his attitude? Would you speak with the Chief of Staff, your Chief Economics Adviser, and your Senior Adviser with your feet up on the Resolute Desk - a gift from Queen Victoria to President Rutherford B. Hayes in 1880? Well that's what children do who have had poor upbringings. They have no respect for the belongings of other people. Someone needs to come smack his feet and tell him they'd better not see his dirty feet on such a fine piece of furniture ever again or he'll be grounded from re-election. So what? Bush did it too. did you make such a post when the former president put his feet on the very same desk with his top communicators in the room? Had not seen that photo of Bush. I don't think he should have done it either. It does not alter what it may say about Obama's attitude. The photo of Bush may indicate that such an attitude is common among those who reach the Oval Office. 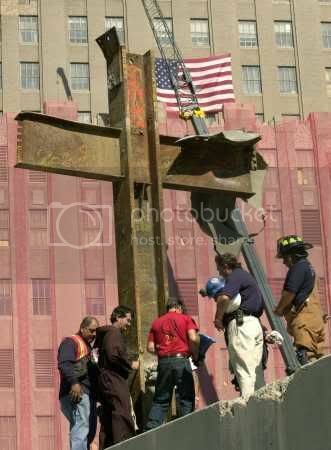 The picture of bush is clearly a photo shop put up by some liberal progressive nut. Look at rove and other 2 people standing they werte all taking fropm other pictures.